Windows Updates will help your system to maintain the system’s integrity and security, updates are delivered on the regular basis by Microsoft. It contains security patches, hotfixes, software updates and more. In case you are not able to update your system or you set this service to off then Windows becomes vulnerable to bugs and security holes. Try one of these quick fixes to resolve common Windows Update issues. This is a usual trick but sometimes it solves host of computer errors and it often works for Windows Update. When you get any error message then restart your system and after it try to run updates again. 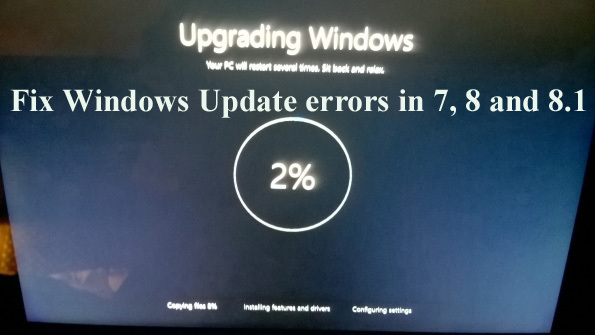 If you haven’t executes Windows Update for some time then it is recommended to repeat this process several times before all available updates have been installed. Sometimes updates may fail because of insufficient disk space. Make sure that at least 1 GB of free space is available. If disk space is not available then perform a disk cleanup to get rid of temporary files. Go to My Computer à right-click on the system drive à choose Properties à click the Disk Cleanup button. This process will take a few minutes. After it, check items with MBs of data, e.g. Temporary Internet Files, Recycle Bin data, and Temporary files. Click OK to delete those files and free up space. Wrong data and time can also prevent you from updating your system. So that it is recommended to make sure that the time and date of your computer system is accurate. Double-click on the time, and set the current date. Reboot your computer and try to update. Fix Windows Update when your computer won’t boot. Sometime when update causes BSODs then it won’t let you load Windows, to fix this issue you should try to boot your system into Safe Mode and uninstall the necessary update that you think of main culprit of this issue. After the removing offending update, restart your computer or laptop. All the above given tricks and tips will help you to deal with all types of update error with ease.